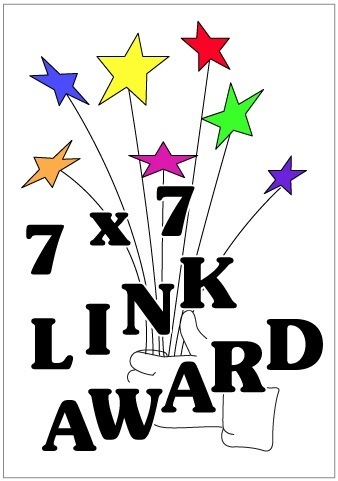 7 x 7 Link Award. Normally, my blog consists of just film reviews, with the occasional page branching off to notable actors and performances that I like. This is a one off post though as I must reciprocate a favour that has been done for me. It’s always nice to have people recognise your stuff and being awarded this allows more people to come across it aswell, which brings me to the rules of receiving the award. Rule #3: Pass this award on to seven other bloggers. #1 Something that no-one knows about me. This is always a hard question to answer and I’m unsure if it even has to be related to film but my daughter was in the same class at school as the son of Scottish actor Robert Carlyle. I met him on several occasions, picking up the kids and had a few brief chats. He’s such a humble and respectful person, as well as, one of Scotland’s finest actors, that often gets overlooked. For those not familiar, his film credits include “Trainspotting”, “The Full Monty”, “28 Weeks Later” and he even played the Bond villain in “The World Is Not Enough”. His television credits include “24”, “Stargate Universe” and the most recent “Once Upon A Time”. Despite these credits, he deserves more work and it was my pleasure to have met him. Andy has a lot of similar tastes to myself and his reviews are informative and easy reading. I enjoy his blog and he is always interacting on others’. This is a great blog from Tyler, If your interested in independent and world cinema. In a short time of following this, I’ve been put onto films I would probably have struggled to come across. Ryan’s reviews are always in depth and well written. It looks like he puts a lot of thought and time into them. That in itself, is worthy of attention. Kevin is another blogger, whom I tend to agree with. His posts and interaction are regular and his reviews informative. Another that I enjoy reading. The Film Fellas consist of four guys who discuss, in depth, all things film. Ive enjoyed there posts and discussions and have always been welcome to get involved. The Cinemaniac knows his stuff when it comes to blogging. He’s just finished his own script and managed to design an app for his site. He was helpful to me when I just started and always gives his opinion on your posts. Fernando is great for interacting with and his reviews are short and sweet. He’s good to have in your corner for having the occasional discussion. Well… That’s it. Apologies to anyone I left out, I enjoy all the people I’m following but some guys thoroughly deserve mention and others could be doing with the traffic. That’s what my decisions were based on. This entry was posted on April 20, 2012 at 10:26 am and is filed under Uncategorized. You can follow any responses to this entry through the RSS 2.0 feed. You can leave a response, or trackback from your own site. Hi there! I noticed you paid my blog a visit, so I thought I’d check out who you were. And I’ll definitely come back to this place! Mr Nobody is indeed an unknown as well as underrated movie. I hope you won’t take it as spamming if I provide a link to my review. My review didn’t get much attention either. Sometimes it’s just nice to know that there are more people out there who share the love for an odd movie. I’ll definitely put your blog into my reader! Hi Jessica. I came across your blog through Tyler. I don’t mind when people send me links at all. I loved Mr. Nobody, it’s a shame not many have seen it. I’ll check your review just now. Cheers. Your very welcome Fernando. I enjoy your concise comments and you are always one of the first to give your opinion on my reviews. It’s appreciated. I’m flattered by what you wrote about me. Glad you like my blog so much, even when I keep changing the layout, haha. Congratulations, Mark. Your welcome mate. I appreciate your input into my blogs. You always have something to say, whether we agree or not. 😉 it’s good to have you onboard. Thanks, I’m about to post about the award. I can’t thank Adam (from 3guys1movie.com) enough. I’ve already started receiving lots more attention. At the end of the day, that’s what we’re all trying to do here. Well done Mark, very well done! I knew you were good at this. Keep writing these brilliant reviews and I have no doubt you will win more awards! Hi Mark, just found your blog through Fogs’ I’ll be checking out some of your posts here. Congrats on the award! Thanks for popping by Ruth. Always glad to meet new blogging friends. Hope you find some stuff you like. It’s a new blog but I intend to add more menus in the future. I’ve just started following you now Ruth. I like the lay-out of your blog. I’ll have a more in depth look later on. Look forward to it. Cheers. Congrats Mark, and thanks. It’s always good to hear when someone appreciates what we’re doing here on t’interwebz! Woo! Marvellous piece of info Ryan. Thanks very much mate. I might just do that. You’ll be there then? Good man! If I make it along, I’ll more than certainly partake in a libation with you sir! Your welcome mate. I thoroughly enjoy your blog and you seem to share a similar taste as myself. Keep ’em comin’ man. Thank you very much indeed Mark. I genuinely enjoy reading your reviews and I loved your Titanic one! Yours was one of the first blogs i followed when I started back in January. well done, great work. Thanks man! Same to you. We seemed to start blogging around the same time and I’m enjoying your stuff also. I’ve had a lot more attention since this humble award. I hope it does the same for you. thanks mark. I had a good read of it so will do my Seven in due course. Good luck mate. It takes a wee bit of time but I’ll be sure to look out for it. I’m interested in your seven choices. i have done it, with a special mention to yourself buddy. Well done. I appreciate the shout out also. Good man. Thanks Adam, it all came from you my man. I got some more exposure because of it. Cheers buddy. Hey man, awesome site and great post. Keep up the good work!